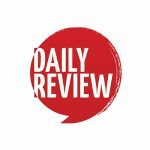 Adele confirms first ever major Australian tour | Daily Review: Film, stage and music reviews, interviews and more. She’s never toured Australia before, but 28-year-old music superstar Adele has sold two million albums down under. One in every 22 Australians owns a copy of her biggest album yet, 21. So local fans wanting to see her live should be ready to snap up tickets for her first full-scale Australian concert tour when they go on sale next Monday. 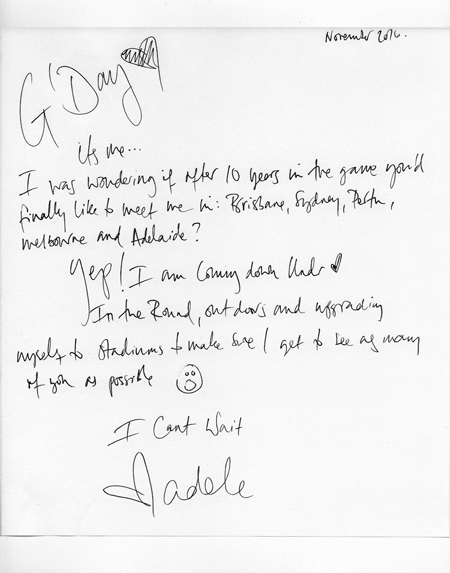 For the last year, Adele has been touring arenas in Europe and North America, but this morning announced she’ll be bringing her unique, in-the-round show to Australian stadiums in late February and March next year. The official announcement comes after she teased the tour in a mysterious advertisement on Sunday night. She released this note today. According to the media release, the 360 degree stage set-up is “designed to create intimacy”, even if the Sydney concert will be performed for more than 80,000 people at ANZ stadium. The set list for her recent tour includes every hit single she’s released over the course of her career, including recent songs Hello, When We Were Young, and the much-adored tracks from 21: Rolling in the Deep, Someone Like You, and Set Fire to the Rain. The tour kicks off at Perth’s Domain Stadium on February 28 before moving to Brisbane, Sydney, Adelaide and Melbourne. So far, only one performance in each city has been announced, but it’s worth noting there’s a fair bit of space between dates which should allow extra concerts to be added. Ticket prices range from around about the $100 for the nosebleed sections to just above $300 to get more up close and personal.